From cyber security to marketing analytics and bioengineering to the life sciences, computer and data science are transforming discovery and innovation in our economy, our culture and our society. Through the Data X initiative, Lehigh is committed to expanding its faculty working in computer science and related fields and to preparing students working across all disciplines to understand, create, and collaborate through the latest technologies and methodologies available to researchers today. Lehigh students working across disciplines developed a mobile app that aggregates news stories from college newspapers nationwide. As a national leader in interdisciplinary teaching and research, Lehigh is dedicated to providing students with distinctive academic experiences that challenge customary approaches to education. Thinking and learning outside the box—and beyond the traditional boundaries of a particular discipline—enables students to find revolutionary solutions to the world’s problems. This lies at the core of the Lehigh experience. Leveraging this strength alongside superior capabilities in computer science, data analytics, journalism and an ever-broadening range of disciplines, Lehigh has developed the Data X initiative, which will significantly expand the university’s capacities in computer science while increasing access to computer science and data analytics to students working in numerous fields across the university. Data X will create new opportunities for researchers and students to use computer science and data analytics to support research and innovation in engineering, business, natural and social sciences, and the humanities, enriching the student experience and developing graduates with increasingly sought-after skillsets. Data X will enable Lehigh to meet the increasing demand for computer science and data analytics among students of all disciplines. More Lehigh students than ever before will develop essential computer science skills and gain a competitive advantage in a world where employers across all industries rely upon computer science competency. Lehigh continues to answer the ever-increasing demand for collaboration, creativity and transformative study through Data X. With an eye toward broader expansion into a wide range of programs and disciplines, initial focus areas of the program will build on existing strengths across Lehigh’s four colleges. Lehigh’s bioengineering program features world-class excellence in education and research and develops critical thinkers and problem solvers in a rapidly evolving field. The incorporation of computer science will allow students to gain deeper insight into complex biological systems. A rigorous and relevant course of study, the marketing program at Lehigh provides an experiential environment through which students can acquire professional-level competencies. The addition of computer science will strengthen student skills in data analysis and enable them to better navigate the challenges of an increasingly digital and social media-focused world. Lehigh’s Department of Journalism emphasizes the role of journalism in today’s global society through a program that teaches traditional skills intertwined with modern practice. Computer science will enhance students’ journalistic abilities with essential technical knowledge in an age of digital media, providing them with the capacity to build a means of disseminating the content they’ve created. Lehigh's commitment to excellence in computer science and related fields extends beyond the boundaries of Data X, and includes departments and faculty spanning the entire university, from engineering to the arts to the life sciences and more. As data increasingly plays a role in researchers from any field, Lehigh strives to attract faculty capable of understanding data, harnessing data, and putting that data to use in the pursuit of knowledge in unique and innovative ways. The Provost's Office welcomes feedback from faculty who wish to become involved with Data X. Questions, proposals and more can be sent to Provost Patrick J. Farrell at pvf209@lehigh.edu or Daniel Lopresti, director of Data X, at dal9@lehigh.edu. 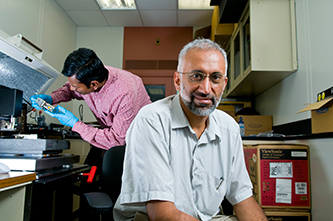 Anand Jagota is professor of chemical engineering and director of Lehigh's bioengineering program at Lehigh. His research interests are in biomaterials, biomechanics, and nanobiotechnology. His group works on properties, processing, and modeling of DNA interactions with nanomaterials, specifically on its hybrids with carbon nanotubes. In another active project, his group works on biomimetic fibrillar interfaces with enhanced adhesion, friction, and compliance achieved by design of near-surface architecture. Currently, Jagota's lab is engaged in research projects in solution-based processing of carbon nanotubes, the biomimetics of fibrillar adhesion, and adhesion and mechanical properties. "We're looking for higher-end computer technology and better capturing and management technology. Most importantly, we need innovating minds so that we can actually understand new questions in an unstructured world."